What is the difference between a doula and a companion? We choose to use the word 'companion' instead of 'doula' to better represent our practice as full spectrum companions. The term doula comes from greek and it means 'a woman who serves', 'a woman that serves woman' and also 'woman slave'. We prefer the term companion because it is more descriptive to the services we offer- we provide physical, emotional and informational support to people of all gender expressions. Ultimately, we use both terms interchangeably trough the website since people are more familiarized with the term 'doula'. How come you do not say 'mother' in your website and refer to 'individuals and family' instead of just family? I am invested on serving people of diverse gender expressions and I also acknowledge that people might go through transitions by themselves and not always have 'family' during birth, abortion or loss. What does a companion do? Is a companion/doula same as a midwife? A companion/doula is a person that has been trained to offer non medical assistance. Spectrum companions provide emotional, physical and informational support to people going through birth, post partum, abortion, loss and bereavement. Companions are not midwives, we are not medical professionals- we bring different skills and roles into the picture. 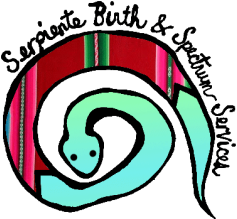 What families is Serpiente Birth & Spectrum Services interested on providing support? We believe that all individuals and families have the right to non judgmental support during life transitions. We are invested on providing support to families of color, LGBT*Q families, single parents, undocumented individuals & families, and allies that understand the way systemic oppression impacts the health and reproductive lives of peoples. My partner(s) and family members will be supporting me during birth and/or post partum, do I still need a companion? The support that your partner(s) and family members offer is invaluable! A companion will support you and your family, we free up your family so they can be fully there with you. We understand that your partner(s) and family members are also going through a birth and they might need emotional and physical support as well, they might even be interested on guidance on how to better support the birthing person. Since we are there with you through the process, we allow your family to take breaks and rest through labor and post partum period. You can learn more about the benefits of hiring a companion here. I have heard about closing of the hips rituals, waltaska, 'mother' roastings and other ceremonies post-partum. Is there anything you offer for people going through post abortion, loss or miscarriage? Yes! Make sure to contact me and I can tell you all about it. got a question? make sure to contacts us!